The influence of the properties of lignin-based polyurethane (PU) coatings on the release behavior of ammonium sulfate was assessed through complete physicochemical, structural, and morphological characterization. The influence of the release medium was evaluated as well. The higher the amount of lignin in the coatings was, the lower the pore diameter and swelling degree and the higher crosslinking were. 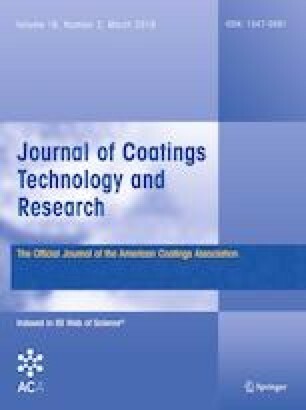 The hydrophobicity of coatings was not significantly changed by increasing the lignin content. However, the opposite behavior was observed for their biodegradability. The results of the nutrient release experiments showed that the two formulations of lignin-based PUs had very similar behavior in terms of release rates of NH4+ and SO42− in both release media, despite their different properties. However, there was a difference between their release rate constants obtained by using three different kinetic models. In addition, both PU coatings released a higher amount of SO42− than NH4+ in both media. The thermodynamic data suggest that dissolution and release processes for SO42− are more spontaneous than that for NH4+. Nevertheless, both coatings behaved in accordance with CEN standards for CRF systems, representing a potential technique for agricultural applications. The online version of this article ( https://doi.org/10.1007/s11998-018-0123-y) contains supplementary material, which is available to authorized users. We gratefully acknowledge the Laboratório de Produtos e Tecnologia em Processos (LPT) for FTIR analyses, M.Sc. Laís Helena and Prof. Dr. Odair Pastor for BET analyses, M.Sc. Lyndervan Alcântara for WCA analyses, M.Sc. Nádia Oliveira for CHN analyses, Central Analítica-UFC/CT-INFRA/MCTI-SISNANO/Pró-Equipamentos, CNPq and CAPES for the financial support.